If you're a Seahawks fan, you had thoughts of the Rams game of 10/10/04 running through your mind during the second half today. Or thoughts of the Cowboys Monday Night game of 12/6/04. Thankfully for us, we can breathe a sigh of relief right now. There's no way in hell that the Seahawks could have afforded an 0-2 start. Sure, the NFC West isn't the best division out there. But 0-2 is 0-2, folks. In 2004, no team that started the season 0-2 made the playoffs. The first half of football from the Seahawks was definitely the best half of football this team has played since last year's Rams game. Yes, the same one I mentioned above. This was a stark contrast to last week's debacle in Jacksonville, which saw the Seahawks crap the bed in the second half. Matt Hasselbeck rebounded from a subpar Week 1, going 20-for-31 with 281 yards and 2 touchdowns. Folks, the Seahawks offense has faced two quality defenses in Jacksonville and Atlanta in this early part of the season. In the first half at least, Hasselbeck had his way with the Falcons defense, which was coming off of an emotional victory last Monday night against Philadelphia. 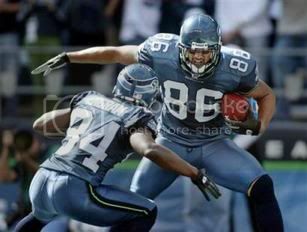 Feed Shaun Alexander. You do that, you win. 28 carries, 144 yards, 1 touchdown. 2 receptions, 11 yards. Another key Seahawk offensive player who was able to rebound from last week. The receivers are catching the damn ball. Oh my God, they're catching the damn ball. Darrell Jackson looks like he's ready for a great 2005 season. Eight receptions, 131 yards for the Seahawks #1 receiver. It's early, but I'm impressed with Jackson so far. Joe Jurevicius is already proving to be a great acquisition. What does he do? Catch touchdowns. His only catch today was a touchdown. We've waited for Jerramy Stevens to show up since 2002. Now, I don't want to say that he's arrived yet. But when he makes a beautiful 35-yard touchdown catch, you want to scream "Stevens is here!". At least I want to, anyway. If Stevens can play well the next few weeks, then we'll show him some love. The Seahawks definitely had a better defensive effort today. They should have, because they were facing a Falcons team that had to travel cross-country on a short week. And they're at home. That's a recipe for success, I think. Sure, they allowed 18 points in the second half. But when the offense can't do diddily poo offensively, the defense is going to suffer. That's how it usually works. "Seattle just doesn't know how to put a team away"
It's the same thing we've been saying for God knows how long. I'm glad that the Seahawks won today, believe me. But there is cause for concern when the Seahawks almost piss away a 21-point lead. If the Seahawks want to be considered an elite team, they have to put away teams at home. Especially a team as good as Atlanta. Media darlings. 'Hawks. Next Sunday. I won't be able to watch it. Damn Cowboys.